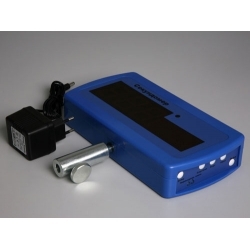 The demonstration stopwatch is used for single-shot measurement of intervals of time, definition of pulse repetition frequency, and also to control the electromagnetic starting device. 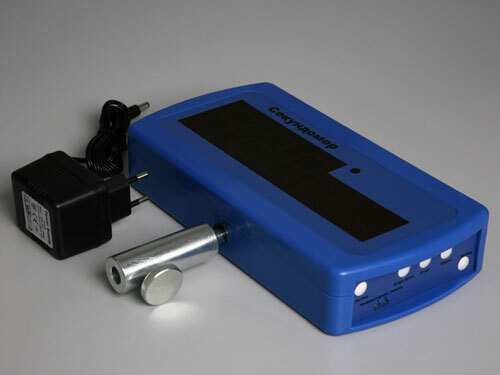 The digital stopwatch is started by electric impulses or in manual mode. Results of measurements, designations of used modes and units of measurement of achieved values are shown on the light-emitting diode indicator located on the front side of the device. It is completely compatible with optoelectric sensor of the moment of time and the starting device from demonstration set "Mechanics". "Т1": Start-up of mechanical system by means of the starting device and measurement of the interval of time between sequential responses of one sensor or between response of the first and response of the second optoelectric sensor. In other words, time between the moments of optical axis coverage of the first and the second optoelectric sensor, or time between two sequential coverages of the same sensor is measured. "T2": star-up of mechanical system by means of the electromagnetic starting device and measurement of an interval of time between the moment of the beginning of movement (pressing button " Start-up ") and response of optoelectric sensor. "Т3": Start-up of mechanical system by means of the electromagnetic starting device and measurement of an interval of time during which the optical axis of one of the sensors has been blocked by anything. "Т4": measurement of an interval of time between sequential pressing the button " Start/stop " (manual mode and stop of the stopwatch). "F": determination of repetition rate of impulses follow. Repetition is calculated on the basis of number of the impulses registered for 1 second. Range of measured values of repetition is 0.005-20 kHz. "N": calculation of number of impulses in time, determined by user. Range of measurement - 0-999 impulses. Range of time measuring in modes Т1-Т4 makes from 0 up to 99.9 sec, and in modes Т1-Т3 within the first second time is measured with accuracy 0.001 sec, further (from 1 sec up to 10) - with accuracy 0.01sec, and from 10 sec up to 100 sec with accuracy 0.1 sec. In mode Т4 within the first second time is measured with accuracy 0.01 sec, and further - with accuracy 0.1 sec. In modes Т4, F and N the starting device is not used. Optoelectric sensors of the moment of time are connected to sockets of the first and second channels, the third channel is used for the starting device control. A current consumed by an electromagnet of the starting device - no more than 0.25 A, a pressure of a feed (constant) - no more 12V. The demonstration stopwatch allows the application of any other sensors of the moment of time and work with electric impulses. - Polarity of a signal - positive. Amplitude of a signal - 1-12 V.
Contact 6: an input of the channel. Contact 8: the general wire. 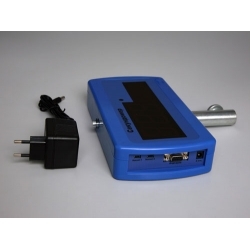 Contact 2 : +9÷12 V the power supply of the starting device. Contact 3: an input of the channel 1. Contact 4: an output of a feed of the starting device. Contact 6: an input of the channel 2. Contact 7: the general wire of a feed of the starting device.